The traditional bowler or derby was popular in the 19th century after the top hat was considered impractical for members of the working class. 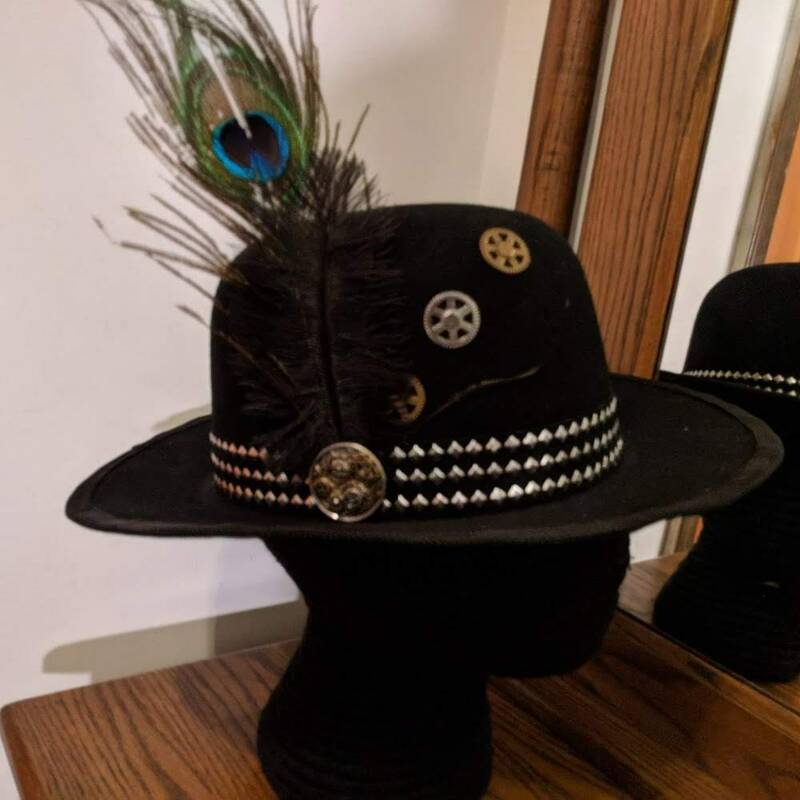 Our version has the following steampunk elements added: 3 studded bands to form a wide hatband, a gear pendant with feathers and gears scattered on the crown. It is made from top quality wool felt. 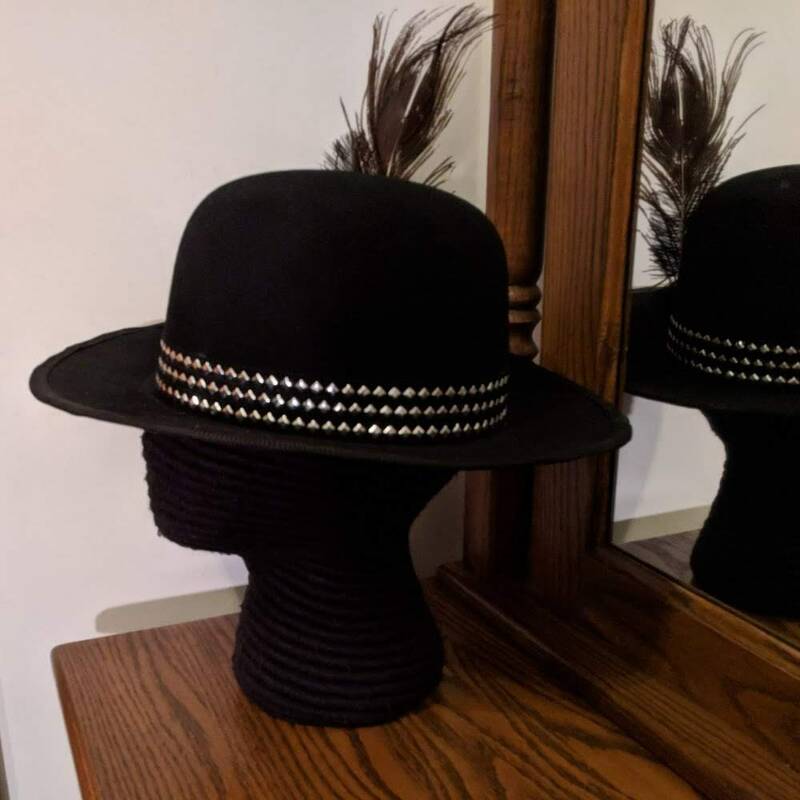 It's a real hat, not a cheap craft felt or costume cloth one! It is unlined and does not have a sweatband. 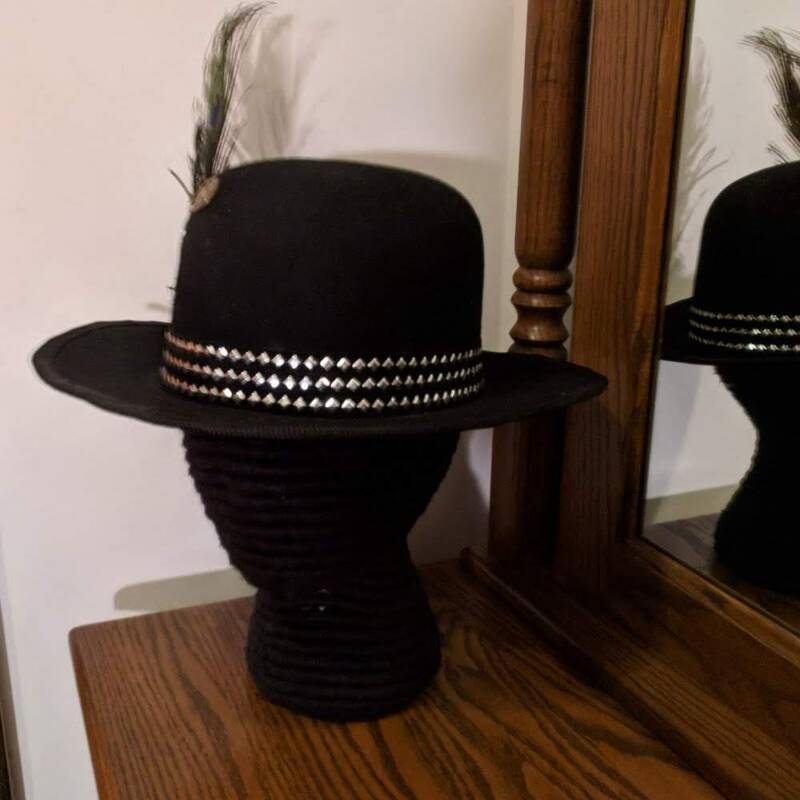 The brim is 2 3/4" wide and the edge have black folded trim. The crown is 5" high. One of a kind! 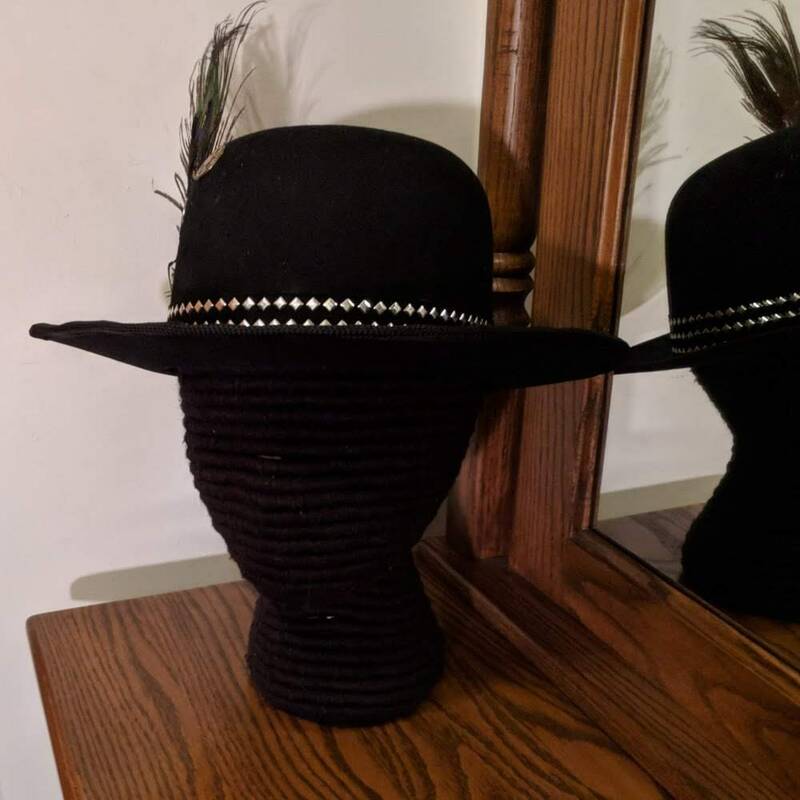 It is a size L (7 3/4) and fits a head up to 23" around at the forehead. 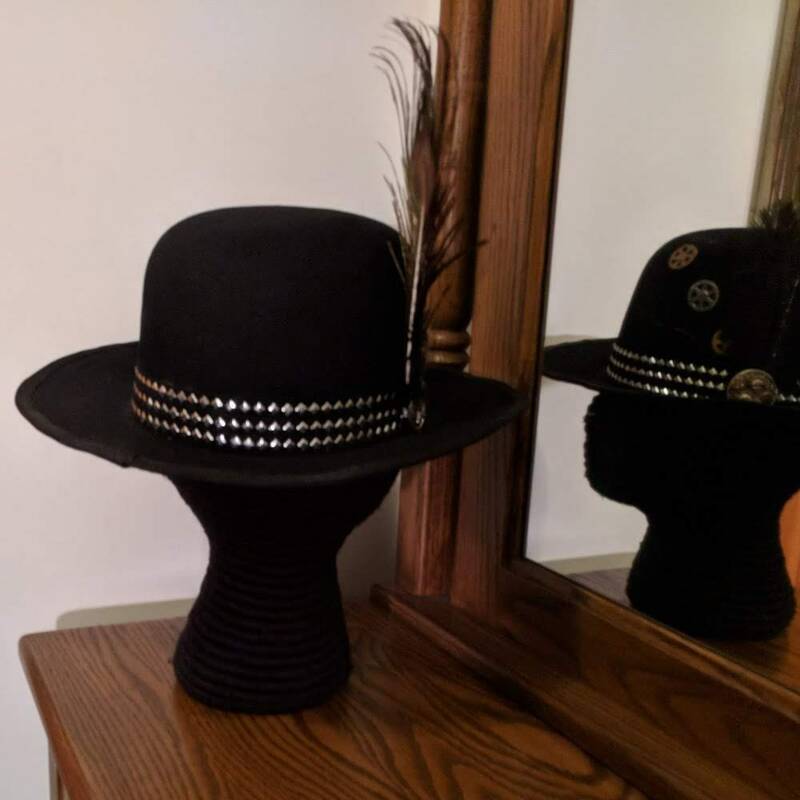 For the upper class we have a top hat with goggles and for the 19th c. military types, we also have bicornes and tricorns with steampunk elements in our Hats and Headwear section. We ship via USPS Priority Mail Insured which has a 2-3 delivery once the package has been posted, plus you can track it on-line. DERBY or BOWLER HISTORY - Also known as bob hat, billy coke, billycock, and derby. It was first made in 1849 for Edward Coke, British soldier and politician and the younger brother of the 2nd Earl of Leicester. He ordered it from the hatters Lock & Co. of St James's as a sort of hard hat, to be close-fitting and to have a low crown so it can protect heads of Coke’s gamekeepers so when they ride they don’t hit their heads on branches of the trees. Before the bowler hat, gamekeepers wore top hats that were too high, got knocked off a lot and damaged when they hit the ground. Lock & Co. gave job to its chief hatters Thomas and William Bowler (hence the name). Story says that when bowler hat was finished, Coke came to London on 17 December 1849, placed it on the floor and stomped on it two times. When he saw that it withstood the test he was pleased and paid 12 shillings for it. Until recently, it was believed that it was William Coke who ordered and designed the bowler hat but a nephew of the 1st Earl of Leicester presented research that proves otherwise. It is now common belief that it was Edward Coke who designed and commissioned the hat. Lock & Co. called it a “Coke” after its common practice to name hats after the one who ordered a custom hat. That explains why after that, the hat was called “billy coke” and “billycock”. In years after that, it was call a bowler hat after the Bowler Brothers who first produced it. Working class loved it in Victorian times, only later to become popular with middle and upper class in United Kingdom especially civil servants, clerks and bankers. Officers of the Queen's Guards wear them as a part of work dress. 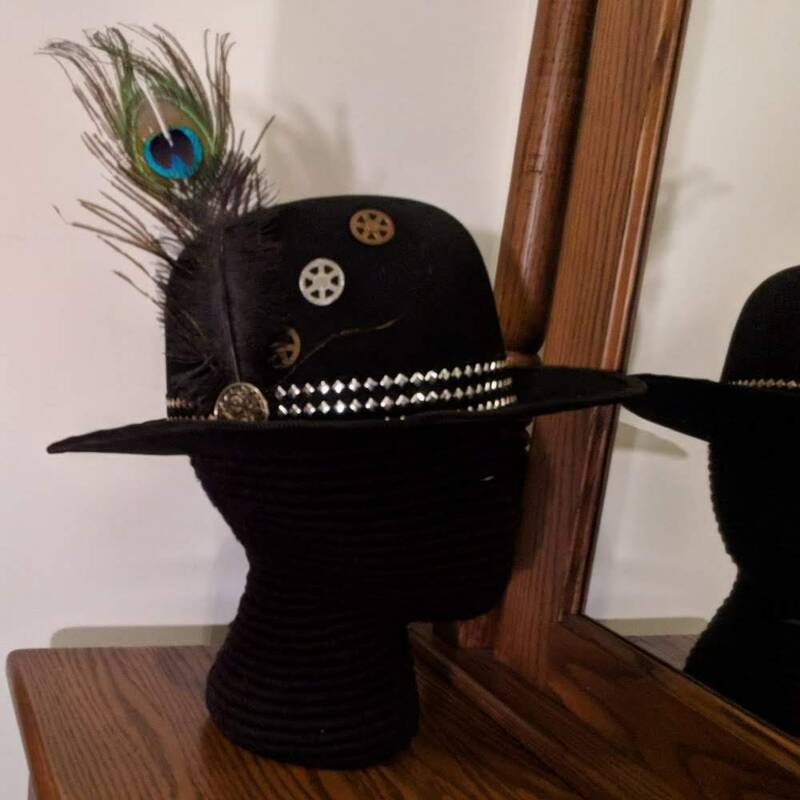 Look for more steampunk hats in our Hats & Headwear section.